Heroku Connect provides seamless data synchronization between Heroku Postgres databases and Salesforce organizations. Without writing a single line of integration code, you can sync hundreds of millions of Salesforce records in near real time using a simple point-and-click UI. Resiliency and data consistency are assured with robust automatic error recovery and easy to use Salesforce centric logging capabilities. This synchronization primarily uses the SOAP API for interactions with your Salesforce organization and starting July 2nd 2015 all SOAP API calls made by Heroku Connect will no longer count towards your API usage limits. Customers can now focus on using Heroku Connect to build apps spanning Salesforce/Heroku while preserving their API usage for other use cases. A key benefit of Heroku Connect is that it makes intelligent decisions about how to interact with the Salesforce APIs allowing developers to focus on writing great apps rather than having to spend time writing complex Salesforce integrations. 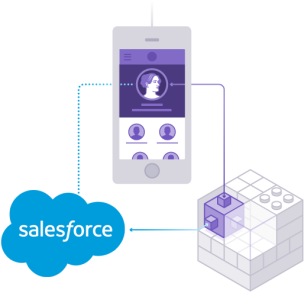 See the Dev Center for more information on how Heroku Connect intelligently integrates with Salesforce APIs to take full advantage of free SOAP API calls. Sync Explorer: Click on any mapping to see record level synchronization status and details of any synchronization errors by record. Salesforce Event Log and Webhooks (Beta): Click on “Connection Settings” to create a webhook for any Salesforce + Postgres connection. Get a real time callback whenever data changes in Salesforce are synchronized to Postgres via Heroku Connect. Heroku External Objects: Heroku Postgres databases are one of the many data sources that can be made available inside a Salesforce organization via reference. Architects can choose which data to show, and which data to sync. See this blog post for more detail. You can try out Heroku Connect by provisioning the Heroku Connect add-on using the free Demo Edition plan. Alternatively, check out the Getting Started on Heroku with Heroku Connect tutorial.